Timid assistant chef, Bong Sun (Lee Bo Young) is possessed by horny virgin ghost, Soon Ae (Kim Seul Gi), and her boss, Sun Woo (Jo Jung Seok) becomes the the target of her aggressive advances. Soon Ae’s death is assumed to have been a suicide, but it is slowly revealed that her demise was connected to Sun Woo’s sister, Eun Hee, and brother-in-law, policeman Sung Jae (Im Joo Hwan). Side dish: Shrek Pasta is a real thing, and Gwyneth Paltrow is all over it. You will find a recipe on Goop, but be warned; it’s just pasta with pesto. Junggugeo Kaenada 중국어 캐나다: “Oh My Ghost” was highly anticipated by us, because it was produced by the same writer and director behind one of our all-time favourite K-dramas, “King of High School Savvy”. Plus, the scenario promised to be entertainingly ridiculous. Only 만: After “King of High School Savvy”, I was ready to watch anything by this team (director Yoo Je Won and writer Yang Hee Seung), because I’ve never seen a K-drama that handled comedy and sadder moments in such a natural style. Lucky for me, “Oh My Ghost” didn’t disappoint. Junggugeo Kaenada: What did you like about “Oh My Ghost”? Only: I enjoyed the way it navigated all the aspects of its story so skilfully. The scary parts, the funny parts, the sadder moments and even the day-to-day stuff all felt natural. There was nothing that ever struck me as being random or tacked on. The acting was also fantastic, especially Park Bo Young doing double duty as Soon Ae and Bong Sun. But, my favourite thing about this show is the fantastic cast of characters. Junggugeo Kaenada: True, the dynamic between the characters was a strength of the series. Obviously, Sun Woo, Bong Sun and Soon Ae made for the most bizarre love triangle. But, there was also the juvenile power struggle of the Sun Restaurant chefs, Sun Woo’s interfering mother, Hye Young contrasted with his agreeably placid sister and brother-in-law, Eun Hee and Sung Jae, and Suhbingo’s antagonistic female bonding with Hye Young and Soon Ae. I could go on and on. Only: I liked the way the characters changed over the course of the series as well. Not only Bong Sun’s progression from downtrodden to confident, but also the way some characters became more lovable the more you learned about them. Suhbingo, for example, started out abrasive and ended up being a great character without really changing. I almost cried at the end when she said goodbye to Soon Ae on the riverside. Junggugeo Kaenada: Then, there is the character of Sung Jae, who became increasingly sinister as the series went on. Just as Park Bo Young did a fantastic job playing both Soon Ae and Bong Sun, Im Joo Hwan was amazingly convincing playing both sides of Sung Jae. In contrast, I think Jo Jung Seok had a more difficult task playing male lead, Sun Woo, because he had to play the straight guy and make the character’s nervous energy appealing. Given the subtlety required to play Sun Woo and convey the character’s personal growth, Jo Jung Seok did a good job. Only: I’m not going to lie: I loved Sun Woo, down to his nervous tics. The way he continuously tried to play cool, when in reality he was a big sap was enormously appealing. There was something very sweet about the way he tried to take care of everyone around him, and how baffled and attracted he was by Soon Ae/Bong Sun. Junggugeo Kaenada: It is good to be reminded about the positive aspects of “Oh My Ghost”, because the middle portion of the series, in which Soon Ae’s possession of Bong Sun was becoming ludicrous, really killed the positive feelings I had towards the series. The writers appeared to have created a scenario that made it hard to determine who Sun Woo could conceivably end up with: a man-eating ghost or a timid wallflower that he and the audience hardly knew. Only: Agreed. At the time, all I could see was a bunch of cute moments that were tainted by the spectre of impending disaster. But, in fact, the show recovered well. There were real consequences of Soon Ae’s and, ultimately, Bong Sun’s deception. Neither they nor Sun Woo escaped entirely unscathed in that scenario, and I appreciated that the show had the guts to go there. Junggugeo Kaenada: Yes, it was refreshing to see that the characters were not given a free pass for bad behaviour, no matter how entertaining it was. However, I was not entirely convinced that Sun Woo’s feelings were ultimately intended for Bong Sun. It felt more like he had no choice. Not to say that Bong Sun and Sun Woo did not have a cute chemistry, but I did not find the romantic dynamic between the timid chef and her nervous, but brilliant boss convincing. Only: I have mixed feelings about it. I really enjoyed Soon Ae and Sun Woo together, but, by the third act, I started to enjoy Bong Sun and Sun Woo together just as much, especially after Bong Sun confessed to Sun Woo about Soon Ae and her possession. Junggugeo Kaenada: The romance between Bong Sun and Sun Woo really took a backseat in the latter part of the series as Soon Ae and viewers focused on the mystery of how she died. Without spoiling the ending, I will say that the second last episode singlehandedly redeemed the series for me. It was so well plotted without unnecessary obstacles, and they managed to make me shed tears for a villain who continued to outrage and frighten me right up until the final scene. Only: No other drama has made me go from terrified to heartbroken so quickly. But, like you said, everything that happened in episode 15 made sense; it was the natural conclusion of the story, without being obvious. Junggugeo Kaenada: I know it is not fair to compare two different K-dramas, but I can’t help comparing “Oh My Ghost” with “King of High School Savvy” and wonder why the first fell short of the latter in my personal estimation. They both feature a great cast of characters, and a ludicrous scenario resolved by good choices made by the writers. Only: I don’t think I had as much of a problem with the middle section as you did. Though, I found myself impatient for the simple reason that I trusted that the writer and director weren’t going to pull a switcheroo on the rules that they had established from the first episode. In that light, it was difficult to watch Soon Ae’s impulsive choices and Sun Woo’s growing feelings for her. Even so, they did address most of that as the show went on. Junggugeo Kaenada: Perhaps, I just was not as enamoured with the pairing of Bong Sun and Sun Woo was I was with Soon Ae and Sun Woo. And, even that couple never thrilled me like the lead couple in “King of High School Savvy” did. As an aside, Seo In Guk looked fantastic in his cameo in “Oh My Ghost”, and had me wishing that he had shown up earlier to create the ultimate love/hate triangle with Min Soo and insubordinate chef, Joon. 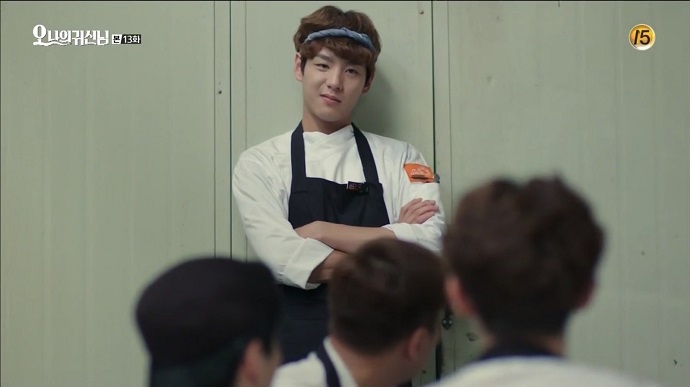 Only: At least Kwak Si Yang would have had more screen time in that scenario. I won’t say he was wasted, because Joon was dreamy, but he didn’t have much to do. Junggugeo Kaenada: If social media was anything to go by, it would appear that many viewers agree with you. And, more screen time for Joon might have pushed “Oh My Ghost” into explosions of hearts and flowers territory for me. As it is, “Oh My Ghost” was still a solid and remarkable K-drama. Previous Oh My Ghost episode 16 recap – Finale! My thoughts exactly. I was so thirsty for Bong Sun and Sun Woo’s romance after the possession confession, but when it happened, I was trying so hard to convince myself that Sun Woo really loved Bong Sun. Their emotional connection through the “blog” and their childhood wounds are not enough signs to show that they really loved one another. I guess it’s the “memory” of them being together which, for me, counts the most. And I hoped the show gave Sun Woo more time to dwell on that and gave them another chance to create new memories as well, making Sun Woo fall for Bong Sun again. This and the “going abroad” thing at the finale are the things that made the show less perfect for me, but you know, the rest is just so lovable. I may be the only one laughing so hard with Sous Chef’s antics, but whoever the actor is, I hope he gets credit. Also, I’ll keep my eye on Im Joo Hwan. Thank you for sharing us your take on the series, Only and Junggugeo Kaenada! Your thoughts sure made the watching experience richer and pregnant with meanings. Keep it up! Thanks for reading and sharing your thoughts, anabear! I am currently watching the drama but im not gonna lie i really hate when soon ae takes advantage of na bong’s body, so with whom did sun woo really fell in love? soon ae or na bong? i hate soon ae really really.